So, you think you have an attitude. 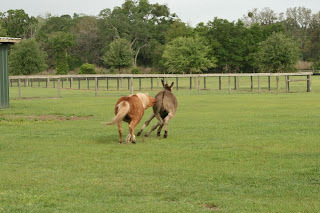 Zeke (donkey) and Sugar (Pony) take attitude to the next level, as you can see in this photo that Gene took. Usually Zeke provokes Sugar into taking action and adds a literal meaning to bite my a**! As bad as this may appear, these two are very good friends. They share the same food. They will eat from the same pan together. When the weather cools, they become more active, as shown here.